Three generations of Winots "smoked" the kings on July 18, 2015. At the end of every charter fishing season there are highlights that stand out above all others. Some years it’s a monster king salmon, steelhead, or brown trout that my anglers boated. Other years it’s a great catch of salmon or trout, even though conditions were tough. This season, though, what really stands out in my mind, is the many outstanding family trips aboard my charter boat, some with adults, some with parents and some great outdoor kids. Getting families on the water to spend time together outdoors is one of the things I enjoy most about charter fishing. Never before have I fished so many trips with so many great families, parents, grandparents, aunts, uncles, brothers, sisters, and kids. Great memories, many caught on film to look back on years later. Fortunately, fishing was really good on most of these trips and the kids, especially, had a blast hauling in, sometimes with a little help, everything from drag screeching king salmon to lunker browns, and, yes, even a few puny 10” smallmouth bass. When kids are fishing, it’s more about tussling with anything with fins that will stretch a line and bend a rod rather than boating a wall hanger. One of the reasons our family charters were so successful this past 2015 season was proper timing. Another reason was preparation before the trip. A third was planning trips specifically for kids when they would be onboard. The best time for families with young children to fish is when the fish are almost jumping in the boat. Most kids need plenty of action to keep them interested. A good trout or salmon bite can happen any time during the season when conditions are right, but the chance of plenty of hookups is better at certain times than others. Fishing in April, May, and early June on Lake Ontario out of Oswego is usually gangbusters for browns, domestic rainbows, lake trout, occasional Atlantic salmon and sometimes king salmon. July also produces some hot brown trout action when they concentrate near bottom just offshore. Either time is ideal for family trips. Families who fish with kids should also consider arranging charters accordingly. One consideration is the length of the trip. Some kids do fine on the water fishing 8 hours. For others, though, a shorter 6 or 7-hour trip works better. Another consideration is time of the season in relation to where we’ll be fishing, nearshore or offshore. The concern is sea sickness. The closer to shore, the less chance of getting queasy on the water. This is the beauty of inshore trips for brown trout and other species in April, May and June. With nearby shoreline to focus on, the chance of sea sickness is far less. Lastly, preparation for a charter trip is important, actually crucial if kids are onboard. If kids are up late into the night and must get up early in the morning to leave the dock at 5:00 AM, chances are they will do more napping onboard than fishing. Also, a big, greasy breakfast that could upset a young, or old for that matter, person’s stomach, is not the way to go. Importantly, if anyone, young or old, tends to have motion sickness, Dramamine is the solution, but it has to be taken according to label directions, well before leaving the dock. Even though many charter boats have enclosed heated cabins, everyone, especially kids, need to wear proper clothing and footwear, especially in early spring. The other thing to look for when planning a trip, some charters offer discounts for families. 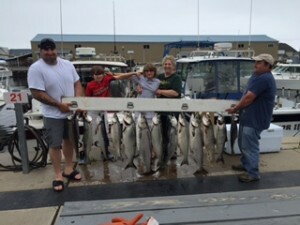 With proper planning and preparation, family charter fishing trips, including those with young children, can be a lot of fun.